The fog had settled over the area like a thick gray blanket. Its density obscured all of the familiar sites from view, making it hard to discern the surrounding landscape. This normally would not be much of a problem except that this morning we were in a boat, on a lake, and lost! Rising at the break of dawn, our family had met at the Camp of the Woods boat dock, one of our favorite Adirondack vacation spots. While visiting John-Keith, who is working on staff this summer, we had planned to water ski while the water was smooth as glass and other campers were still snoozing in their bunks. When we thought the fog was lifting, we all boarded the sleek motor craft and entered beautiful Lake Pleasant. Our jaunt was soon cut short when we realized that the fog was thicker on the lake’s surface than it was on the land. We quickly lost vision of the dock and surrounding shore, and realized there was no simple way to find our way back, let alone water ski. There was only one thing to do. We cut the engine and waited. The guys searched their phones for GPS signals to give us guidance while the rest of us scanned the shore to find any familiar shadows that would give us an indication of where we were. As we sat drifting quietly through the blinding mist I could not help but think how much of life is like this experience. We set out to accomplish a goal or do what we think is the right thing, and we end up in a blinding fog wondering what went wrong and which way to go. Often we experience moments of panic wondering if everything will be ok and if we will ever find our way back home. As the uncertain moments of our early morning adventure dragged on, each person on board the boat listened and watched intently. Soon we heard the sounds of nearby cars moving down the main road of the small town. We knew that we had drifted quite a ways from the boat dock. So turning the wheel, John-Keith maneuvered us back in the other direction and, following the GPS signal, we finally found our way back to the moor. So, too, in life, when you are drifting directionless through a foggy situation, cut the engine and wait! Call out to God for guidance, scan the horizon, and listen intently. Soon you will hear a voice behind you saying, “This is the way, walk in it.” He will make the directions clear and He will guide you safely home. Ripples of water licked the edge of the beach front on beautiful Lake Pleasant in the Adirondack Mountains. The summer sun shimmered pleasantly while many guests lounged on the warm sand soaking in its rays or cooled their tanned skin in the crystal clear waters. In the distance engines roared to life, laughter filled the air, and water skiers tried their sea legs for the first time of the season. Everyone was relaxed and away from the pressures of every day life except for a few. 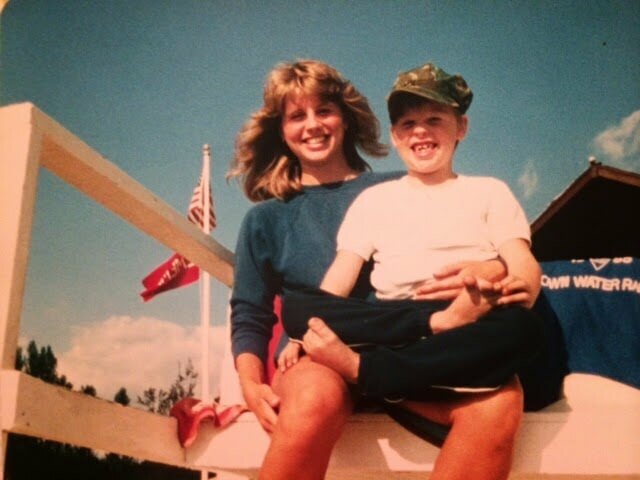 Your Uncle David and me in 1986 at Lake Pleasant. Each hour five or six young men and women did rounds at the beach front. We climbed the high white chair to perch above the crowd or swam with one arm while carrying a towel with the other to the floating dock at the far end of the swimming area. Upon arriving at our post we spent the next 60 minutes focused on the lake, body ready, eyes roving back and forth. We scrutinized and counted the bobbing heads and colorful suits over and over making sure that the swimmers were safe. Though I enjoyed my summer lifeguarding opportunities, I understood the seriousness of the job. It is not one to be taken lightly, especially when working at a large lake with not as much visibility as a pool. That responsibility helped me to appreciate more fully today’s verse. The eyes of the Lord are in every place keeping watch on the evil and the good. Though as a lifeguard I could only see one place at a time, I know that the Lord can see everything at once. There is no place you can go from His Spirit or anywhere you can flee from His presence. If you were to rise into the heavens, He would be there, or if you were to make your bed in the depths of hell, even there He would see you. There is no place that is outside of His vision. I am grateful that I can live in safety knowing that God is the guard of my life. So run and jump into life’s lake waters. Enjoy the opportunities that God gives you. Live confidently in the knowledge that the greatest Lifeguard of all is keeping His eyes on you and there is nowhere you can go that is outside of His sight. Young love is so refreshing! Recently Dad and I had the opportunity to get to know a young couple who are looking forward to getting married and spending their lives together. In spending time with them we were invigorated by the intensity of their feelings for each other. The young man recently even wrote on 365 sticky notes reminders of what he loves about his intended and covered the wall by her bed with them. These types of intentional efforts make such a difference. They help keep a young love so new and fresh. I remember when Dad and I first met. 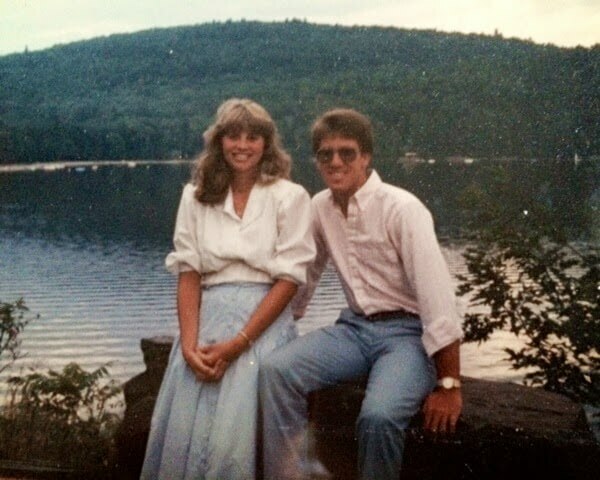 We were both spending the summer at Camp of the Woods in Speculator, NY. Dad was directing the teen activities and I was teaching 4-6th grade children during the daily chapels along with lifeguarding at beautiful Lake Pleasant. As we got to know each other that summer we shared details of our lives and spent much time together. At the end of the summer Dad went back to Ohio and I returned to my home town in Wayne, New Jersey. We continued to write letters to each other regularly – this was in the days before email, cell phones, and texts – and to enjoy occasional phone calls and visits. We worked hard to show each other in big and little ways how we felt about each other. After getting married it is easy to get busy in the routine of life. The ecstatic feelings of love die down (and it is a good thing because nobody could survive on Cloud Nine forever,) but a deeper, stronger, more secure love begins to grow. It is important to work at keeping the spark of love alive because the struggles and difficulties of life can sometimes choke out what should be constantly growing. It takes work but is well worth it! When we accept Jesus as our Savior we enter into a love relationship with the God of the universe. At first we may experience the thrill of belonging to the Almighty and the lightness of our sins forgiven. Our minds and hearts are constantly full with all God has done for us. But often over time we can begin to forget and lose our first love. This is what happened to the church in Ephesus. They were going through the motions of belonging to God. They toiled with perseverance, did not tolerate evil men, and put to the test all who called themselves apostles. But they had stopped doing the “love deeds” they had done at first. The relationship lost its newness and was just a matter of surviving the daily routine. This was a very serious digression to God. He told the Ephesians that they needed to repent and do the deeds they did at first or He would come and remove their lamp stand in the world. Whether in our relationship with our life mate or with God there is work involved in keeping our first love alive. If you don’t want the spark to die out you must continue to do the things you did at first – the little things matter as much as the big things. Keeping communication open, listening to each other, showing thankfulness, and putting each other first are crucial. So have you lost your first love for God? If so, maybe you should sit down, write out all His blessings, and fill a wall in your room up with sticky notes to help you remember.